... the Power of the SUN !!! 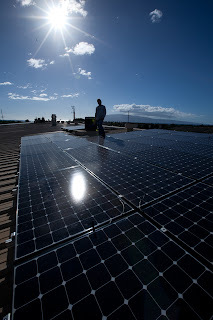 but we're finally running our shop on solar energy! The installation of 32 photovoltaic panels was completed in December 2012 by HNU Energy, a Maui based company. After a long wait for the final checks and approval from MECO, the solar system was up and running in February 2013. You can't imagine how difficult it was to wait, and wait, and wait to get to use these beauties! in Extended Horizons' eco-friendly operations. 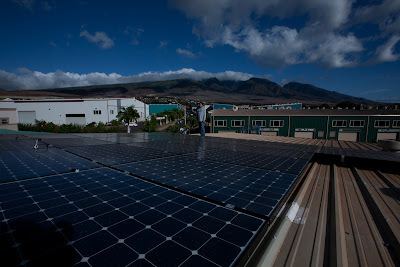 During our first full month on solar power, EH generated 1,787.71 kWh. That translates into 3.46 barrels of crude oil conserved and 2,829.8 lbs of carbon dioxide emissions avoided! have been pumped with the power of the sun!